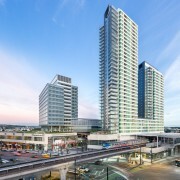 The recently completed Marine Gateway mixed-use complex next to SkyTrain’s Marine Drive Station and bus loop has won a global award for excellence from the Washington DC-based Urban Land Institute (ULI) for its innovative and forward-looking approach to design and development. Twenty-five extraordinary developments from around the world have been selected as finalists for ULI’s 2017 Global Awards for Excellence, widely recognized as one of the land use industry’s most prestigious award programs. This year’s finalists include three located in Asia, two in Europe, and 20 in North America, one of which is PCI Development’s Marine Gateway project located in Vancouver, British Columbia. A group of winners chosen from the finalists will be announced in October at the 2017 ULI Fall Meeting in Los Angeles. The finalists (with the names of the developers and designers in parentheses) are listed here. Over one million times each day, a train, bus or ferry operated by South Coast British Columbia Transportation Authority (TransLink) in the Greater Vancouver area is boarded. That translates to approximately 418,000 people—or about 18 per cent of Metro Vancouver’s population—taking a trip on public transit on a typical weekday. The five busiest TransLink stations have more foot traffic than Vancouver’s busiest street corner at Robson and Burrard. In order for this level of frequent transit use to be successful, it is essential that people can walk to transit services quickly and conveniently from the places they live, work, shop and play, says TransLink. 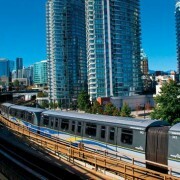 When the skill of the construction team bringing in mega-project Marine Gateway is drilled down to one feat, it is the ability to raise up a project with two residential towers only yards from an operating rapid-transit line and a commercial and office tower over a busy bus loop serving South Vancouver. “We actually built underneath the (Canada Line) guide-way on the north side and connected into the station on the south side so that people (in the residential towers) living there don’t have to go outside,” said Ledcor Construction Limited project manager Crystal Schroeder, who worked the project with senior project manager Jonathan Boyce and senior superintendent Carlos Perdomo. BISNOW: Transit Is The Key To Marine Gateway’s Success. Here’s Why. BISNOW, Ryan Starr, April 18th, 2016. PCI Developments just cut ribbon on Marine Gateway. 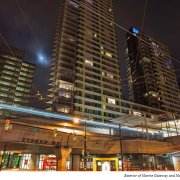 President Andrew Grant tells us why the first major mixed-use project to be directly integrated with the Canada Line is a catalyst for big change in sleepy South Vancouver. 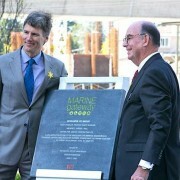 Andrew’s seen above right unveiling a plaque with Mayor Gregor Robertson during Marine Gateway’s launch event earlier this month. A one-block, five-acre site previously home to an ICBC depot at SW Marine Drive and Cambie Street has been transformed into the largest transit-oriented development outside downtown. The 820k SF mixed-use LEED Gold community includes a 14-storey office tower anchored by clean-tech firm Westport Innovations. There are 461 condo and rental apartments in two towers. https://pci-group.com/wp-content/uploads/5715059344fbc_PCI_Marine_Gateway_Gregor_Robertson_Andrew_Grant.jpeg 484 710 Jodi /wp-content/uploads/PCI-Developments-logo.png Jodi2016-04-26 17:17:292016-04-26 17:33:25BISNOW: Transit Is The Key To Marine Gateway's Success. Here's Why. Most people save downsizing for their retirement years, but Vancouver’s Kevin Li recently went from a house to a condo at age 37. He swapped the bigger space his home offered for a place that came with built-in community, one that’s springing up around Marine Drive at the south foot of Cambie Street in Vancouver—an area that, until recently, consisted mostly of a scattering of low-rise offices and barren industrial land. 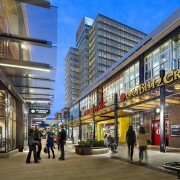 Li was one of the first people to move into Marine Gateway, an 830,000-square-foot mixed-use development that anchors the burgeoning neighbourhood known by the City of Vancouver as Marine Landing. The recent opening of Coast Capital Savings’ “Help Headquarters” completes the first phase of The HUB at King George Station development and marks the next step in the impressive evolution of Surrey, B.C. 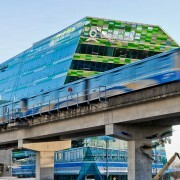 “Surrey is a really exciting place with a growing, young and educated population, with the Surrey city centre — where we are — anchoring it at this transit hub,” said Tim Grant, vice-president of investment for PCI Developments Corp., the company that built the 185,000-square-foot facility for approximately $100 million over two years. [With] Emily Carr’s move in 2017 from Granville Island to a new campus a few kilometres away in the False Creek Flats neighbourhood, lying just south by southeast of the downtown, a short walk from the Olympic Village, the art university is being proclaimed a catalyst for a commercial real estate development boom. “It’s going to be a catalyst for further development, not only on this site, but I believe in and around the area,” said Anita Molaro, assistant director of planning for the City of Vancouver.